For almost 30 years, Sandfield has been an organizer of lesbian and gay Jewish activities and of Jewish AIDS programs in Chicago and internationally. In 1978, Sandfield joined Congregation Or Chadash, which has served Chicago's gay and lesbian Jews since 1975. From 1979 to 2003, Sandfield was a continuous member of the congregation's Steering Committee and Board. In addition, he chaired several congregation committees and completed one term as treasurer and three as president. Sandfield has represented Congregation Or Chadash at meetings of the Chicago Interfaith Group, the World Congress of Gay and Lesbian Jewish Organizations, and the regional board of the Union of American Hebrew Congregations. He has attended almost all International Conferences of Gay and Lesbian Jews, served as president of the World Congress of Gay and Lesbian Jewish Organizations in 1985-86, and co-chaired the 11th International Conference in 1989, when it brought almost 400 persons from at least eight countries to Chicago. 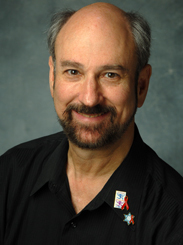 Sandfield was a 1993 cofounder of the Jewish AIDS Network-Chicago and currently Chairs the group, which offers Jewish services and referrals to persons affected by HIV disease and AIDS. He has also been active in other Jewish AIDS work and was vice president of the Howard Brown Memorial Clinic's fundraising Brown Society in 1985-1986. In 1996, Sandfield organized and co-chaired the first International Jewish AIDS Network Conference in Washington, D.C., bringing together Jewish AIDS workers from four countries during a display of the AIDS Memorial Quilt. Sandfield was a delegate from the World Congress of Gay and Lesbian Jewish Organizations to the Lesbian/Gay Interfaith Alliance, and in 1991 he organized the alliance's national Presidents' Conference in Chicago, which brought together leaders from most of the two dozen American gay and lesbian religious groups. Whether in leadership or behind the scenes in fundraising or advisory roles, throughout his activist career Sandfield has worked to support relations between Jews and persons of other religions in Chicago's gay and lesbian communities, to foster those communities' growth and welfare, to strengthen Congregation Or Chadash as a center for gay and lesbian Jews in Chicago, and to maintain liaison with the larger Jewish community.